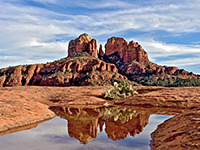 Cathedral Rock lies at the edge of a group of isolated red buttes on the south side of Sedona, about five miles from the main line of sandstone cliffs to the north, and together with Courthouse Butte and Bell Rock on the far side of AZ 179, is one of the most photographed formations in the area, due in part to the easy access from the highway. Most other scenic locations need a bit more driving to reach, on side roads, followed by a longer hike. 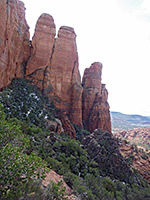 The Cathedral Rock Trail is only 0.7 miles in length, climbing quite steeply up an open slickrock slope beneath the butte to a viewpoint at the base of the sheer cliffs at the center - on a saddle which links the peak to an adjacent flat-topped summit to the south. 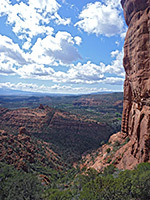 The path gains 600 feet in elevation so is a little more strenuous than its short distance might suggest, and fewer than half the people who start make it to the end, though the views just little way along are still very good, looking northwards towards Sedona and the colorful mountains beyond. 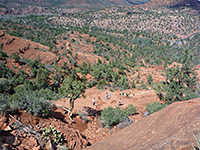 One shorter target is a promontory known as Courthouse Butte Vista, reached after 0.3 miles. The trailhead for the hike is half a mile along the paved Back of Beyond Road, which forks westwards off AZ 179, 3.4 miles south of the US 89A junction. This road dead ends a little way further at an upscale residential development, its houses built on a gently sloping, cactus and tree-covered hillside above Oak Creek. The parking area is rather small, accommodating only 18 vehicles, and often fills up by mid morning, but extra space is available on verges and on a stony streambed which crosses a little further along the road; a usually dry drainage but one prone to flash floods. From the trail register at the car park, the path crosses the wash, climbs a little up a sandy slope past trees and bushes, to a rocky area, where the vegetation quickly fades away, allowing for the first good views of the surroundings. The recently constructed Templeton Trail intersects, then the main route begins a steep slickrock ascent, mostly straight up without switchbacks, occasionally crossing a small gully but otherwise over a smooth, exposed rock face, aided by steps at a few places. The route is marked by extra big cairns, made by enclosing piles of stones in wire mesh. A less steep section, where the trail traverses southwards a way, is followed by the final sharp ascent to the saddle, where for the first time the lands to the south and west come are revealed; ahead stretches an expansive vista across bushy red rock country towards the distant Black Hills. The far side of the butte is equally steep, and the rocks at either side rise up vertically, so there is no chance of climbing any higher, though an unofficial path does continue southwards another quarter of a mile, leading to two more saddles.